The Nobel Prize for Physics, announced this morning, has been awarded to David Wineland of the United States and Serge Haroche of France for their work in quantum optics. Through their innovative laboratory techniques, Haroche and Wineland have managed to measure the properties of charged atoms (ions) and particles of light (photons) without altering or destroying the tiny particles. Quantum mechanics deals with the physical properties of matter at the smallest and most fundamental level, that of the atom and subatomic particles. Quantum particles, including electrons and photons, can behave as both a wave and a particle. This wave-particle duality manifests itself in a departure from classical physics. Basically, the classic laws of physics that we can observe on the macro level do not apply at the micro level. An example of the paradox of quantum mechanics occurs when a particle is observed. In order to detect a quantum particle, like an electron, a photon must interact with it. In doing so, the interaction will change the path and properties of the electron. Haroche and Wineland were able to overcome the observer effect by sending quantum particles through a trap to control their properties. A possible application of these traps is in the field quantum computing. While in classic computing bits can take the value of either 1 or 0 (on or off), quantum bits (qubits) can be 1 and 0 simultaneously, doubling the amount of possible states. A quantum computer with only 300 qubits could hold more information than there are atoms in the entire universe! Both Haroche and Wineland were born in 1944 and came of age in the post WWII world, a time of incredible scientific and technological advances including the discovery of DNA, the space race, and the birth of quantum physics itself. The work of Haroche and Wineland exemplifies the creativity necessary for ground-breaking scientific achievements. Learn more about quantum mechanics and this year’s Nobel Prize in Physics here. 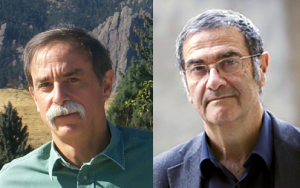 David Wineland of Colorado (left) and Serge Haroche of Paris, winners of the 2012 Nobel Prize for Physics.